I'm off travelling again. After years of being condescendingly dismissive of cruises as a travel experience, I've now given in and have signed up for a cruise. I only have knitting to blame for the situation I find myself in. 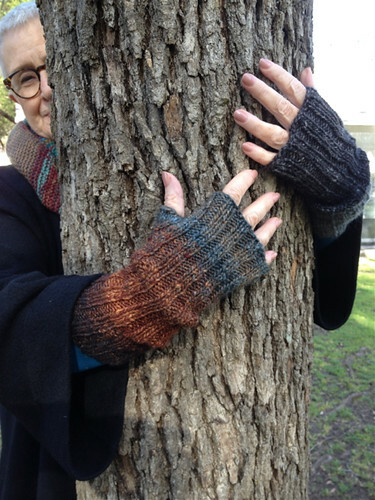 My desire to improve my colourwork knitting led me to browse websites of classes by modern colourwork guru Mary Jane Mucklestone. I discovered she was giving classes on a ship travelling across the north Atlantic. Then I discovered the destinations - from Copenhagen to Bergen in Norway, the Shetland Isles, the Faroe Islands (the Faroes! - my current fantasy travel destination), Iceland, Greenland, Newfoundland and Nova Scotia in Canada, and finally, New York. Lots of my travel and knitting obsessions in one trip. So, after the usual nightmare of flying from Sydney to anywhere in Europe I'm now in Copenhagen for a couple of days before my cruise. 'My cruise'. I never thought I'd need to write that. Despite the fact that it's late summer in Copenhagen the weather is uncannily similar to what I left in Sydney's winter - squalls of rain, wind, sunny patches and a maximum temperature of around 17 celsius. 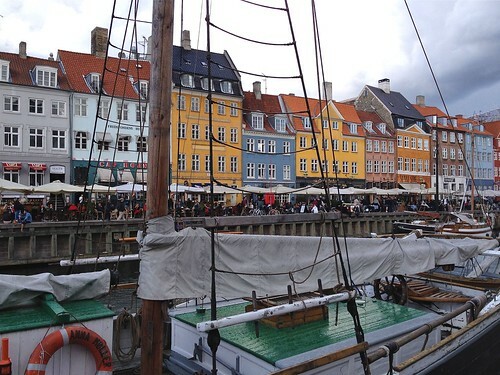 Nevertheless, Copenhagen is wonderful. Very civilised. I think one of the joys of knitting with Noro is the unexpectedness of the colour combinations and sequences. I have a kind of informal personal knitting rule for Noro which is to simply accept whatever colour comes my way as I'm knitting with it. 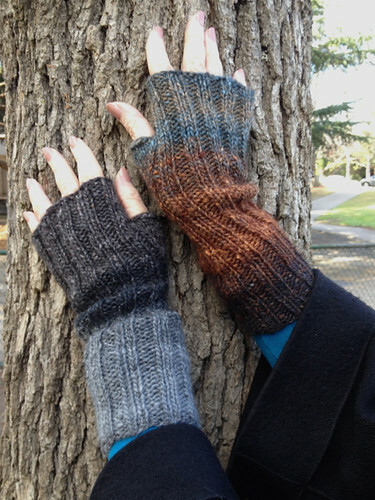 In this case I not only have a pair of nicely slouchy mitts, but they're totally unmatched. They have the added benefit of matching - to the extent that this is ever possible with Noro - a Zumthor hat I knitted a couple of winters ago. [Thanks to Margarita for the fun photos]. I also decided I needed a kind of between seasons scarf for the wide range of temperatures and climates I'll have on this trip. (You can never have too many scarves). Again, this was a very simple knit with bands of stocking stitch and reverse stocking stitch alternating diagonally across the scarf. Most appropriately, the pattern is 'Groovy'. 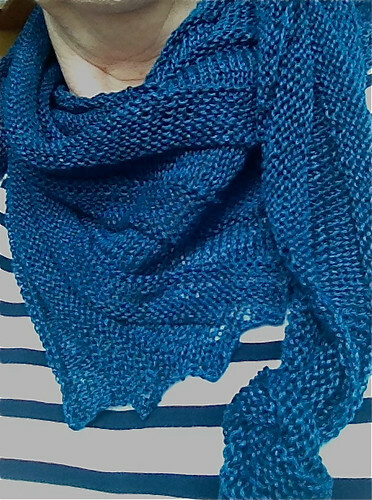 I've knitted the scarf from 100% linen. After finishing it I washed the scarf quite vigorously to make the linen softer. I decided not to block the scarf but rather to dry it in a way that preserved its grooves. I'm very happy with the outcome. I'll report back on its usefulness. 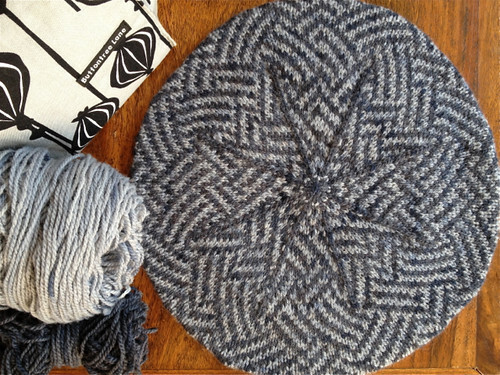 Very occasionally, you love absolutely everything about a knitting project. 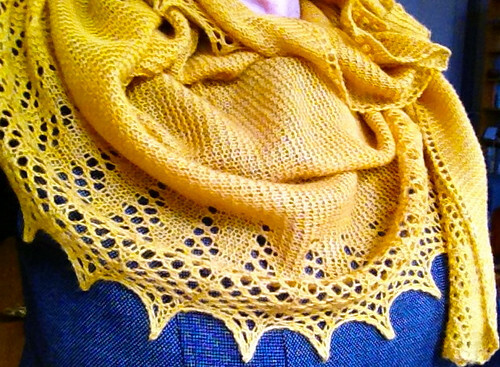 I was besotted while I was knitting this scarf - or shawl - and I now wear it everywhere. I don't want to be separated from it. It's one of those knitting projects that gives great results from a relatively simple and easily memorised pattern. 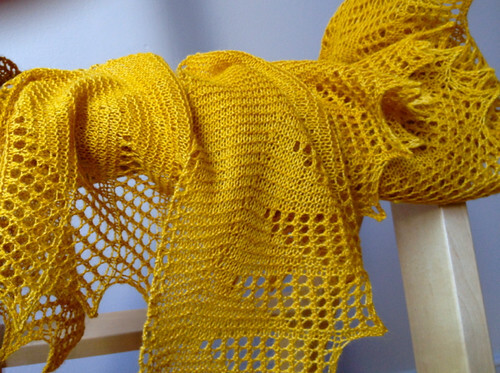 The lace edging makes everybody think it's much more challenging to knit than it really is. It's another of Kate Davies' designs, a Hap for Harriet, and I've knitted it in Cascade Yarns' laceweight silk/wool blend that's rather oddly called Forest Hills. Because it's knitted from a single 100gram skein of laceweight yarn it's wonderfully light and soft and ideal for mild Sydney winters. Along the way I've had to develop a theory that yellow is the new neutral so that I can wear the scarf with just about anything. Of course, when most of your clothes are grey or black this theory can hold up rather well. I've enjoyed making this scarf so much that I'm tempted to cast on for another, even though I have no need whatsoever for yet another scarf. Still, that's never stopped me in the past. 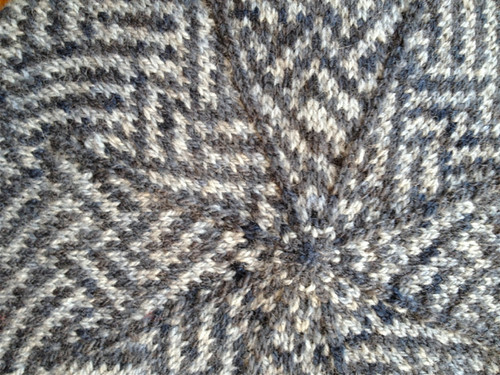 I've had a small hiccup with yet another of Kate Davies' wonderful patterns - a hat she's named Fugue. The yarn for this was acquired from the ever-enabling MissFee a couple of (several?) years ago. I finally decided to knit this up as part of my goal of becoming more proficient at colourwork. The hat's knitted on relatively small needles from a thickish sportweight Corriedale yarn and consequently is dense enough to probably be waterproof, or at least damp and shower-proof. A very Scottish hat. But my problem is that the hat's slightly too big, and because it's relatively heavy it falls around my eyes. I just don't have enough hair to anchor hats securely. I guess I have various options for my too-big hat. I could pull it out and re-knit it to an appropriate size, but I think this might take my colourwork practice just a bit too far. I could give it to someone with a bigger head or more hair, but I like it and want to keep it. So, I'm going to try sewing some grosgrain ribbon to the inside of the band - like many old-fashioned berets had - to try to make it fit me. Wish me luck!